Tomorrow’s scheduled slate of four games has been reduced to three following Westshore’s forfeit in the Men’s Third Division match. The Valhallians need to fill two complete men’s teams for their trip to Nanaimo and simply put, do not have enough players for the third match. This is a plight faced by CW earlier in the season when they failed to meet a Comox obligation. All clubs, seemingly with the exception of Comox and UVic Saxons are seldom able to field fifteen players if their Reserve team has a game, matches often being played with ten or twelve and even then, being loaned players by a bountiful UVic program so that players can get a trot. It is a noble and valiant effort by clubs to grow the game but it falls particularly hard on a club such as Comox with players paying for registration dues for few games which often are not competitive. Would a solution be for them to be in the second Division in Times Cup action or even playing on an exhibition basis? Then the argument would be made; what about those ten or so players from Cowichan and CW who would now have no source of games? Clubs have even combined to get a match for these players who still have to pay enough for insurance, registration and club dues. It appears to this observer to be more than the elephant in the room this season! The other three games are “on” with slightly altered start times. The Premier Women will k.o. at 11:15 a.m. Our Comox visitors were rolling along with some large differentials in their games until two weeks ago when cellar-dweller, Nanaimo caused a huge upset and put the sole blemish on their record. Although this Island League has a strong flavor of “development” to it, the competition is not lost on players. Tomorrow’s affair should maintain interest from go to whoa, although noted in the coaches notes is the fact that Comox might be under-manned. 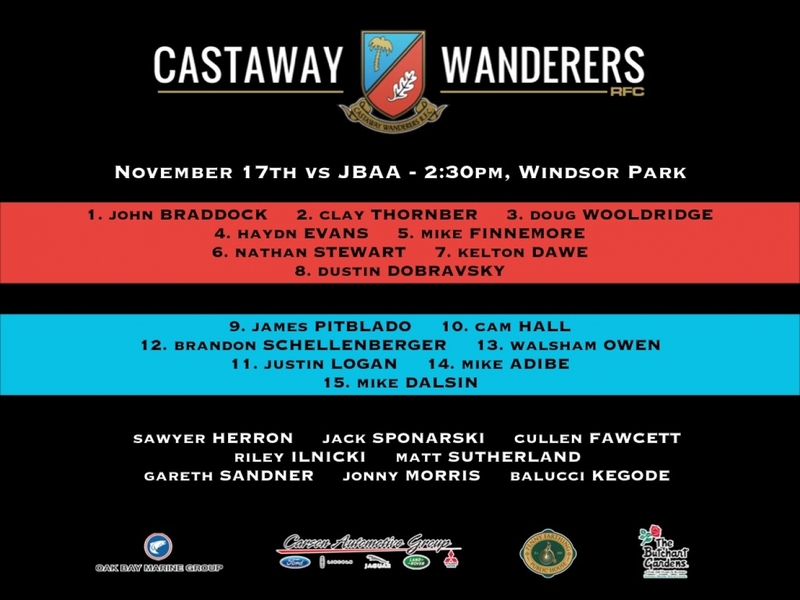 CW’s announced starting XV is strong. Amy Hawkins will Captain from her lock position and there will be plenty of experience surrounding her in the pack. Jess Hardy and Megan Crump in the FRF and Nicole Shaver and Lizzie Adams in the back row being foremost. The backline includes Lauren Sargent, Sya Trafford, Julia Folk, Frelen Gorst and Sara Einarson, all players of worth. The Reserves take the pitch at 12:45 and both clubs have been struggling at this level. The hosts have shown glimmers of potential but little fruition. We hear our brothers across town have struggled with numbers this season however only two points separate the teams on the ladder. It’s always spirited enough between the two and we expect tomorrow’s encounter to be no different. CW will welcome the return of Kyle Horan in the forwards and Balucci Kegode returns from two weeks of Premier duty, in the backs. The Premiers k.o. @ 2:30 p.m. James Bay have had their moments this season, with leads in many of their matches only for failure to close. On the other hand, CW has had some close encounters with the result going their way. Players to note with James Bay are; van Heyningen, a regular in the FRF, Jimmy de Goede, week in and week out, playing some good rugby, Abdelmonem and Wakefield as loosies, both having achieved some higher level of recognition. The backs feature three players of note; Josh Thiel at #10, Nieuwenhuysen in the centers and the speedy, Nate Tough on the wing. Others in this week’s selection are unknown to this pundit. For CW, the pack remains the same as that which faced UVic last week, this week with a mandate to finish! The backs have been re-jigged again with the steady and experienced #9 specialist, Pitblado, returning to link with Hall and Dalsin slots back to #15 with Schelly and Owens pairing in the centers. CW certainly has a target on their backs and James Bay will be out to prove to their fans that their last outing against UVic was an aberration. There will be no room for rest nor error for the hosts. This match is always a ‘classic’ in some form or another and a ‘must see’. Go, CW!